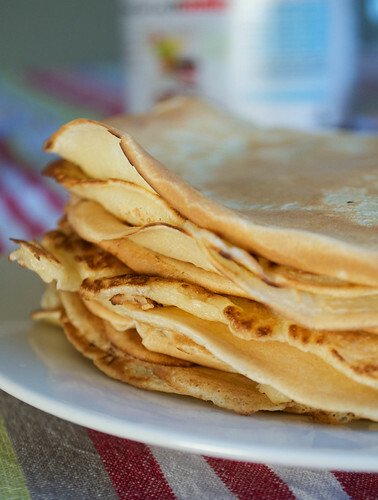 Do you eat pancakes on Shrove Tuesday? We do. And not just for pudding or breakfast but for dinner, too. The thing with pancakes is that they're predominantly eggy, so if an ingredient works well with egg, you can bet it'll be fine with pancakes. And don't think just sweet - there are so many savoury ideas too - in fact that's how I like them the best: with some snipped chives sprinkled into the batter or a handful of sharply-flavoured, grated cheese. Indian spices: So. When you think about it, a pale, flat pancake isn't hugely unlike a naan bread, or a wrap. And soft, eggy pancakes work brilliantly with robust and aromatic Indian spices. Instead of serving rice next time you make a curry, serve a stack of pancakes instead. Add black onion seeds (also known as Nigella seeds) to the batter, or a pinch of garam masala or turmeric. 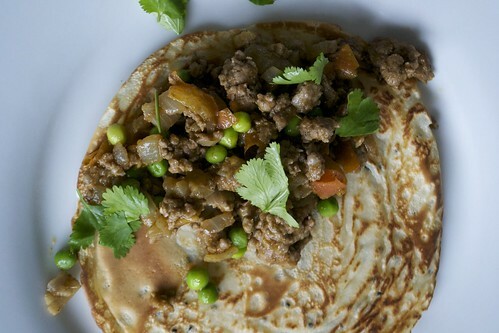 I love them with my Keema Karai, made with lamb mince and a generous scattering of fresh coriander leaves over the top. Ham, chorizo, pepperoni, bacon: These ingredients were made to go with eggs: and they'll give some salty smokiness to a pancake filling. Likewise with tomatoes. In fact, come up with a tomato and chorizo stew layered between some soft, chewy pancakes and you'll have hit the spot. Cheese: You don't just have to have cheese as a filling, although slices of melted Gruyere and thickly-sliced smoked ham folded between pancakes would be divine. With cheesy pancakes, I like to grate a little cheese into a sturdier American-style pancake, fried in little discs and flipped over when the bubbles start to pop on the surface. Add in ingredients like paprika, spinach, chives, spring onions, black pepper, red pepper or chilli flakes, too, for flavour. And try different cheeses: Grana Padano and Parmesan are good, but a soft goat's cheese would work well too, whisked in to the batter before frying. Chinese: In Chinese restaurants they don't serve crispy roasted duck along with pancakes for nothing. Make your own and combine it with some crunchy vegetables - sliced cucumber, carrot, spring onion - and roasted, shredded meats or your choice. Fruit: Anything goes, really. Strawberries, blueberries, raspberries, mango, pineapple - and lemons, obviously - just anything. One of my favourite pancakes when I was little was a big, eggy pancake spread with raspberry jam and then sprinkled with some sugar. OK, so the sugar content was a bit OTT but that's what I liked. Bubble a handful of blueberries or raspberries in a pan with a spoonful of maple syrup until it's thick and syrupy and drizzle that over your pancakes, too. Or slice a banana and add a drizzle of honey or a spoonful of almond butter. Vanilla: Add a teaspoonful of vanilla paste to the batter itself - or the filling. If adding to the batter, you'll end up with beautifully fragrant and speckled pancakes that taste a bit like doughnuts. Especially with raspberries alongside. Chocolate: Chocolate chips, chocolate chunks, bashed chocolate, melted chocolate. 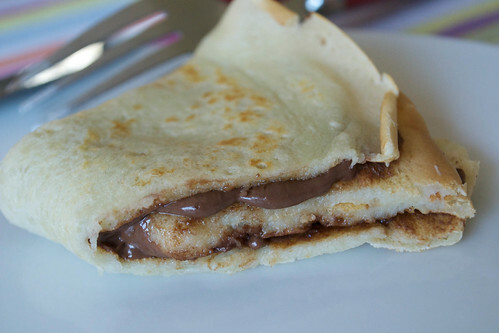 The pancake can take just about any chocolate in any of its forms. Dark chocolate, milk chocolate and white chocolate, too. Nutella, even. Check out my chocolate chip pancakes which I regularly get bullied into making on Sunday mornings for the kids. Caramel: In Argentina, we only ate one thing spread on our pancakes - and that was dulce de leche. Incredible stuff. Have I missed any? What do you like to eat with your pancakes?